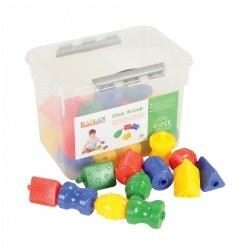 Infants and toddlers can begin to perfect their fine motor skills with Kaplan's large array of over 200 developmental toys. 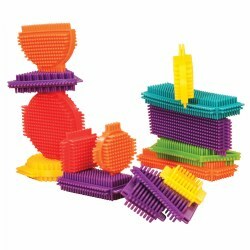 Interlocking blocks and chains, puzzles, activity kits, stackers, and rattles help preschoolers develop the small muscles of their hands and fingers, making it easier for them to hold and use pencils, crayons, and scissors. 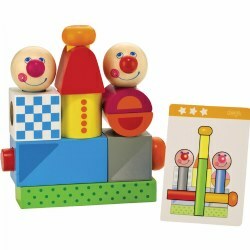 Available in bright colors and whimsical shapes, these tools with toy appeal will inspire every imagination. 2 years & up. 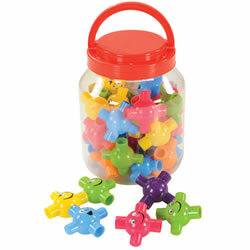 This wooden box is packed full of engaging activities to stimulate cognitive, visual and tactical senses. 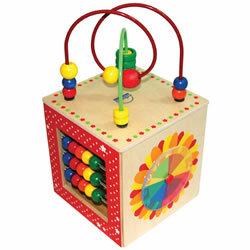 Features mirror, classic bead activity on top with 12 beads, rainbow clock and abacus for counting. 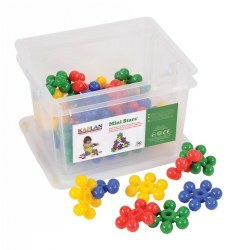 Every side of the box provides fun developing hand-eye coordination. Play cube measures 7"L x 7'W x 13"H.
2 years & up. 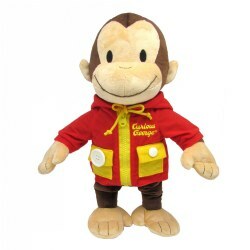 Features an adorable removable jacket that helps teach children four essential dressing skills and encourages hand-eye coordination. 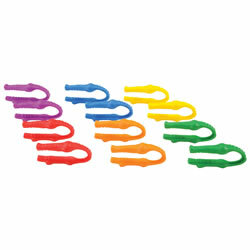 Encourages children to learn zip, tie, button, and snapping skills. Measures 16" tall. 3 months & up. 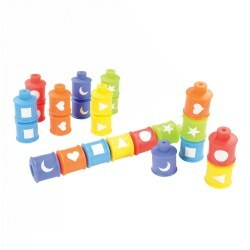 Durable and easy to grip, this 3 1/4" rattle promotes fine motor skills and provides multiple sensory skills (sound, touch, balance/weight). Assorted colors. 12 months & up. 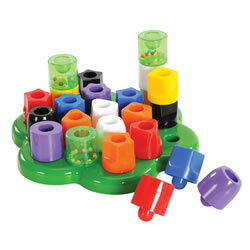 36 colorful snap-ball connectors in assorted colors. 12 of the snap-balls have happy faces to add smiles and interest to any creation. 6 months & up. 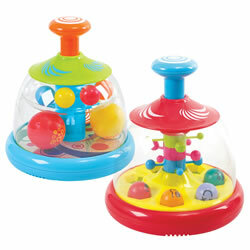 Toddlers will delight in the two different styles of spinning domes. One spinner sounds like popping popcorn and the other has a softer sound and slower movement. 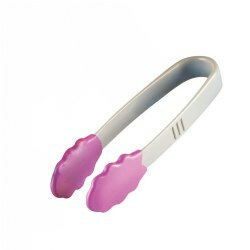 Stimulate the senses and build motor skills with just a push on the spinner's handle. 6 months & up. Toddlers will delight in this spinning dome. 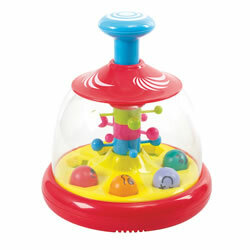 Stimulate the senses and build motor skills with just a push on the spinner's handle. 12 months & up. This 14 piece set of soft and flexible jumbo textured beads snap together and pop apart. 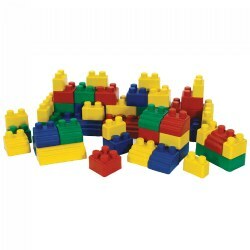 Their colorful and large size fits well in the hands of infants and toddlers. 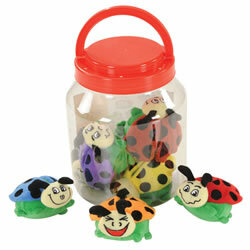 The bumps and lumps in the soft beads provide an easy sensory grip for tactile development. 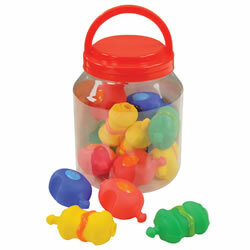 These beads re great to enhance creative visual and fine motor skill development. 6 months & up. 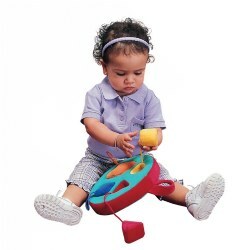 A multisensory toy with activities that support developing infants. 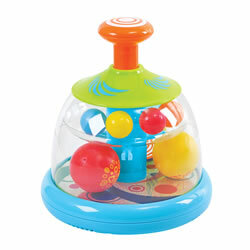 The rolling middle features a mirror, row of beads for manipulating, and wind-up music box that plays a soothing melody. 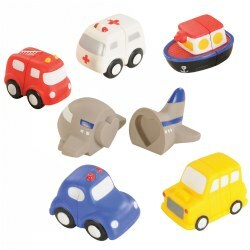 Rolls easily to encourage crawling. 2 years & up. 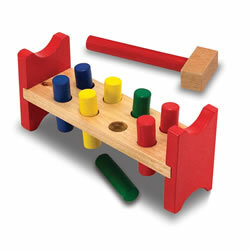 Hammer the eight brightly-colored, wooden pegs into the solid wood bench, then flip to begin again on the other side! Simple, yet immensely entertaining! Wooden hammer included. Measures 11" x 4.8" x 3.5".